There is an easy solution to head lice – vinegar. The procedure is simple too. Rinse the head and entire body with apple cider vinegar after showering or bathing. Description: Head lice are tan to grayish-white in color. The adult louse resembles a miniature flat ant. They have a head, thorax and abdomen with six legs, but their two front legs are very large in order to grab and hold onto hair shafts. Life cycle: Lice eggs (nits) on the hair very close to the scalp are the primary sign of an active infestation. A female can lay up to 100 eggs in 30 days. She glues her eggs, which look like tiny white beads, to hair shafts very close to the scalp. Eggs are very small, about the size of a period ".". Eggs may appear white, yellowish, brownish or grayish, but are almost always lighter colored. An egg normally undergoes a 7-9 day incubation before hatching as a baby nymph. Head lice have no wings and move primarily by crawling. They have no adaptations for jumping. Nymph: The nit hatches into a baby louse called a nymph. It looks like an adult head louse, but is smaller. Nymphs mature into adults about 7 days after hatching. To live, the nymph must feed on blood. It metamorphoses 3 times before it reaches the adult stage. 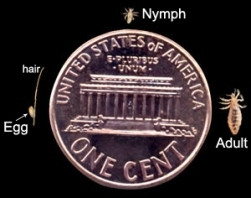 Most head lice at this stage are almost transparent until they have eaten (sucked blood from human skin). Then they can be seen more easily since it will be possible to see the tiny amount of red or brown blood in their stomach. To the un-aided eye, it will appear like a small red dot usually about 0.5 mm or less in diameter. With a magnifying glass or microscope, it is possible to see the head and legs. Adult: To live, adult lice need to feed on blood. Females are usually larger than males, and can lay several nits in a day. If the louse falls off a person, it usually dies within 1-2 days. A female may continue to lay eggs on other materials similar to the texture of human hair such as stuffed animals with long strands of hair. The most common symptom is itchy scalp, caused when the louse bites through the skin to feed on blood. The lice themselves are essentially harmless, although excessive scratching may cause bleeding of the scalp, which may increase the risk of microbial infection. Shower or bath twice a day with herbal soaps such as tea tree oil products or Dr. Ohhira’s microbial soap. Then rinse with apple cider vinegar. Adults can use it straight out of the bottle but diluting it with water may be needed for children. Be careful because vinegar can burn eyes. I use apple cider vinegar often because it is so good for the skin. Clean all of the infected person's contaminated belongings: clothes, towels, and bedding will need to be washed in hot water, and their mattress and room vacuumed thoroughly. Use the hottest setting on the dryer and dry for the longest time you can without harming the fabric. Adding orange oil to the wash will also help. Shaving the Head - Shaving off all the hair is not necessary. Unfortunately, toxic chemical pesticides are still on the market and being used by unwise parents. Unbelievably, Lindane and Dursban were specified often in the past. Products still on the shelves contain pyrethrum and synthetic pyrethroids. That’s horrible advice.These products cause or can increase allergy problems, especially for children with asthma. Here are the most common chemicals currently used for head lice treatment and their possible side effects. All these should be avoided. Pyrethrums: A natural pesticide made from the painted daisy. Though naturally derived, pyrethrins are still pesticides that have been banned from use in food production and should be banned altogether. The concern is that pyrethrins can cause pneumonia, muscle paralysis, death due to respiratory failure, vomiting, and asthma. But it is still a major component in head lice treatments such as NixTM. Pyrethroids are synthetic chemical counterparts (as contained in RIDTM) that have similar but even stronger side effect. Permethrin: This is a broad-spectrum synthetic pyrethroid insecticide. As above, it also can cause vomiting, asthma and pneumonia, muscle paralysis and death due to respiratory failure. Carbaryl: A pesticide that is often found in head lice treatments. Formulations vary widely in toxicity to the nervous and respiratory systems resulting in nausea, stomach cramps, diarrhea, and excessive salivation. Other symptoms at high doses include blurring of vision, affects coordination, causes excessive sweating and possible convulsions. 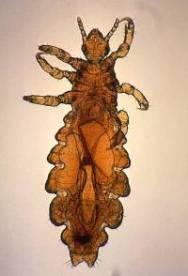 Link to lice being resistant to chemical treatments. By the way – head lice can’t develop a resistance to vinegar or coconut oil.